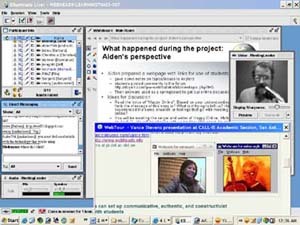 Latterly the evolution of virtual classrooms has some fearing a return to a teacher-centric transmission model of education. Immediacy of synchronous environments: this appeals to more social learners, those who are 'field-dependent' (ie require a degree of structure), and those for whom the anytime/any place approach is just a handy excuse for not doing it! How do you teach effectively in these environments? What makes a good face to face teacher? If I just talked without pause for 7 minutes, without reference to any visual material or asking questions how would you feel?